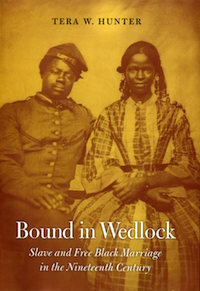 Tera Hunter, a professor of history and African American studies at Princeton, has been awarded the Mary Nickliss Prize in U.S. Women’s and/or Gender History from the Organization of American Historians (OAH) for her 2017 book, Bound in Wedlock: Slave and Free Black Marriage in the Nineteenth Century. Hunter researched court records, legal documents and personal diaries to illustrate the constraints that slavery placed on intimate relationships. Her own great-great-grandparents, Ellen and Moses Hunter, were enslaved, freed and then married during Reconstruction. Read more at News at Princeton.